You may like your clothes dry and your martini’s dry, but the last thing you want when it comes to your vision is dry eye. Caused by environmental factors and medication, dry eye can be uncomfortable and downright obnoxious. Luckily, here at Papale Eye Center, we specialize in treating chronic dry eye so that you can get back to seeing and feeling like normal once again. To help you better understand this condition, we have created a brief guide. Read on to learn more. Why Are Your Tears So Important? Yes, tears are a great way to show someone your true emotions and to even get your way on occasion, however, they are there for a few medical purposes as well. Tears provide your eyes with lubrication, they wash away things like dirt and dust, keep your eyes smooth and clear, and reduce the development of infections. With the lack of tears or with an insufficient amount of them, your eyes are more prone to getting damaged and developing infections. 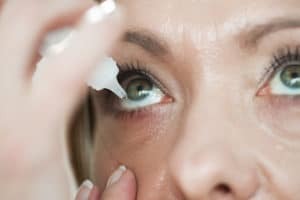 What Are Symptoms of Dry Eye? Yes, the dry eye does cause your eyes to feel dry and less lubricated, but it can also cause them to sting, burn, itch, and just feel overall irritated. If you are suffering from any of these symptoms, schedule an eye appointment with us at Papale Eye Center. Luckily, dry eye can be addressed in a variety of different ways. Depending on how severe your condition is, we will likely start you off with a prescription strength eye drop medication. These will be used to coat your eyes and hopefully speed up the production of natural tears. If this treatment doesn’t work, we may recommend a tear conservation treatment. During this treatment, your tear ducts will be blocked with a silicone plug with one goal in mind: to keep the tears in the eyes there for longer. If you have started to experience symptoms of dry eye, we at Papale Eye Center can help. To learn more about this and other eye conditions, contact our Papale Eye Center office today to schedule an appointment!